The Missive Maven: Who's excited for Halloween?!? Halloween is my favorite holiday. 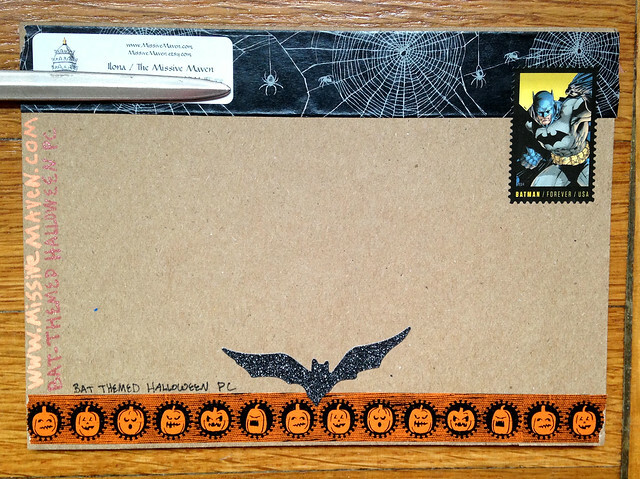 If you've been following my blog for long, you'll know I've done many, many posts about Halloween and Halloween mail. Partly this is because I adore bats, but also because I just like the spooky autumnal mood. I can't really explain why I love Halloween so much, I just do. So it tends to be around Halloween that I'll jump back into Swap-bot for a couple of Halloween-type postcard swaps. 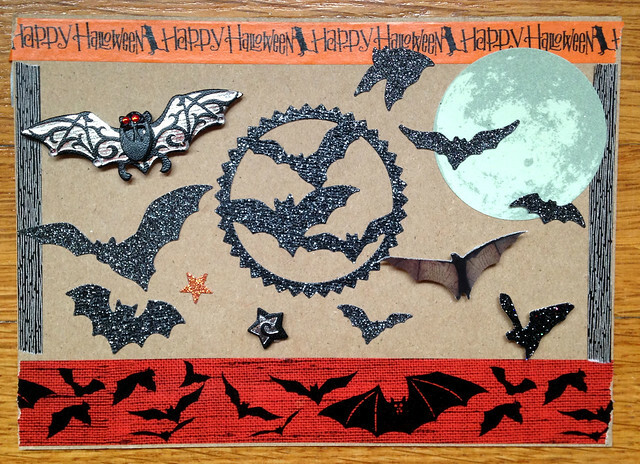 I just participated in a Bat-themed Halloween postcard swap, which involved a handmade bat postcard. Can do! I had great fun using my bat washi tapes and stickers. Of course this was a perfect occasion to use one of my brand-new Batman stamps, just issued last week. Now that I'm posting the photos, I just realized that I never used any of my great bat rubber stamps on it! Oh well, there is plenty more mail (October and otherwise) for that. Halloween is absolutely the best season for crafting, mail, et cetera. I'll miss it when it's gone! I LOVE the mail you've created this year. Bats are probably my favorite part, too--I've been making bat confetti with my hole punch all month! Looks great! God, I'm into those Batman stamps! Thanks - and Batman stamps, me too!